Are you a second grade teacher who aligns your work to the Common Core State Standards or a seller who wants to quickly correlate products to CCSS for grade 2? 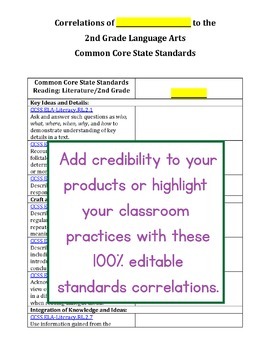 This 100% editable second grade math and language arts standards correlations document links to all standards online. For teachers, this can save you time as you organize formal lessons or document your work. Just type in activities you do on the right side to meet the standards on the left. Simply delete cells that don't apply. For sellers, it's a great tool for showing teachers and principals exactly how your products can meet children's needs--and why schools and districts should adopt your work. ***If you are 100% satisfied with my products, please give them 100% positive ratings. Note that this product was meant to be simple and functional--not creative. I don't mind if you write "n/a" in that section! If you are less than 100% satisfied, please contact me first before giving less than perfect ratings. I will either work to meet your needs or give you a 100% refund. ALL of my products come with a money-back guarantee. ***Please follow me at "Miss Jenny and Edutunes." Thanks for considering my materials. I hope I can make a difference in your classroom! Thanks to Sarah Peccorino for your ADORABLE pencils and Kimberly Geswein for your cute fonts.